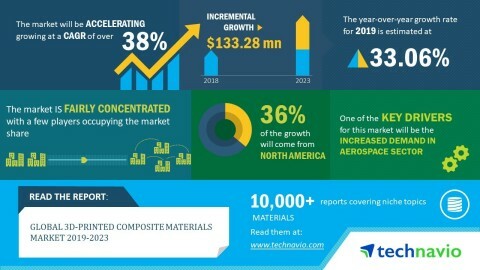 LONDON--(BUSINESS WIRE)--The global 3D-printed composite materials market is expected to post a CAGR of more than 38% during the forecast period 2019-2023, according to the latest market research report by Technavio. “The increasing demand for 3D printing from various industries such as aerospace and defense, consumer electronics, and medical sectors is contributing to the growth of 3D-printed composite materials. For instance, Boeing uses a variety of 3D-printed components in its aircraft, ranging from the F-15 fighter jet to 787 Dreamliner commercial aircraft. Harris, a technology company, recently tested the performance of 3D-printed radio frequency circuits. The performance of these circuits were found to be equivalent to the circuits manufactured by conventional techniques. The growing use of 3D-printing technology among such industries will boost the market’s growth during the forecast period,” says an analyst at Technavio. The global 3D-printed composite materials market is set to post a CAGR of more than 38% during 2019-2023, according to Technavio.